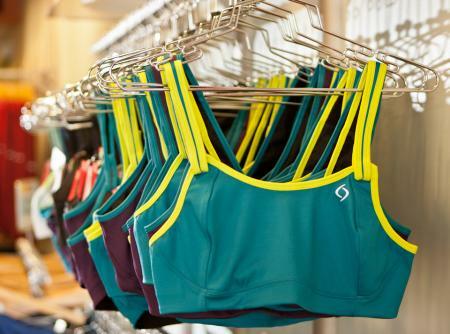 Finding the right sports bra is easier than you think. 80% of women wear the wrong size bra. Women who don't get fitted typically buy a bra with a band that is too big & cups that are too small. This will leave you feeling unsupported & uncomfortable! *Get Measured - ﻿A good fit will help ensure proper support. A woman's size can change quickly due to weight loss, weight gain, pregnancy, etc., so get measured after any such change. * Don't Double Up - ﻿You don't need to wear two sports bras to achieve support. We have a variety of high-impact bras that are designed to support & protect the full-cup woman. * Don't Get Too Attached - ﻿A sports bra should never celebrate a birthday, and should be replaced every 6-12 months. Fabric & elastics break down over time, and your sports bra will stop working effectively. * ﻿Make It Three - ﻿Consider having 3 good sports bras in your wardrobe: one you are wearing, one in the wash, and on ready to go. Not every workout is the same, so you may also consider different styles for different activities. A good sports bra will provide superior breast support, comfort, breathability, and moisture control. We have sports bras for a multitude of shapes, sizes and support levels. Breathe ability for a cooling flow of air. At least 25% Lycra to compress the breasts sufficiently. How to determine your size? About 80% of women wear the wrong size bra. Here is a good way to help you determine your size. *Band Size: Measure around your rib cage, just under your breasts. The tape should be snug but not too tight. Add 5" to this measurement and round up to the next even number. *Bust Size: Measure loosely around the fullest part of your bust, keeping the tape straight across your back. Round up to the next whole number. *Cup Size: Subtract your band measurement (step 1) from your bust measurement (step 2). The difference between the two determines the cup size. The straps are designed to do the least amount of work. A good sports bra will fit more snugly than a regular bra. Remember that the life of a sports bra is approximately 6-12 months or 52 washings. We carry the best sports bras from Moving Comfort & Enell, for all types of fitness activities. Not sure which size is right? Our bra fit process will help you determine which bra is right for you.